Bluetooth, Rear View Camera, Heated Seats, Aluminum Wheels, Steering Wheel Audio Control! 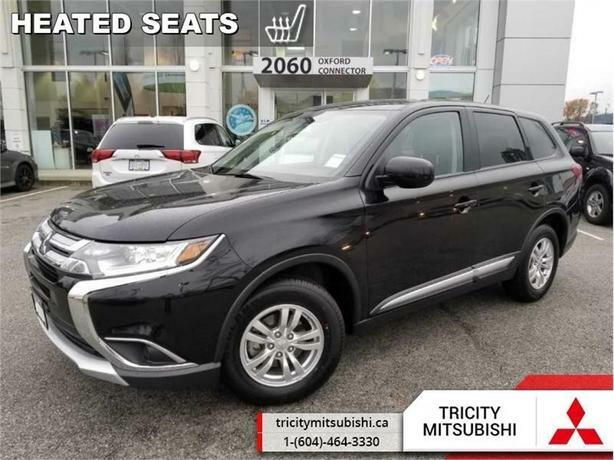 This Mitsubishi Outlander is entertaining to drive while having plenty of room for passengers and cargo. This 2016 Mitsubishi Outlander is for sale today. This Mitsubishi Outlander offers an excellent value in the compact SUV segment. Designed with eye-catching style and a spacious interior, there's plenty of room and comfort to enjoy the great Canadian outdoors. This Outlander also delivers strong performance and composed handling which adds to its versatility. With so much versatility, you can be confident that your Outlander will keep on delivering for years to come. This SUV has 60818 kms. It's black in colour and is completely accident free based on the CARFAX Report. It has a cvt transmission and is powered by a 166HP 2.4L 4 Cylinder Engine. This vehicle has been upgraded with the following features: Bluetooth, Rear View Camera, Heated Seats, Aluminum Wheels, Steering Wheel Audio Control. It has some remaining factory warranty for added peace of mind. Our Outlander's trim level is ES. The ES trim makes this versatile Outlander an incredible value. It comes standard with an AM/FM CD/MP3 player, Bluetooth phone interface and streaming audio, a rearview camera, steering wheel-mounted audio and cruise control, dual-zone automatic climate control, heated front seats, aluminum wheels, and more.